Accounts Officer- Passed CA/CMA Inter or MBA Finance and 3 Year Work Experience in Similar Field. Jr. Executive HR/Admin- Passed Graduation and 5 Year Work Experience or MBA in HR/Personnel Management and 1 Year Work Experience. Eligible Candidates can Attend AIATSL HR Executive, Officer Walkin Interview 2019 at the Given Venue and Schedule. 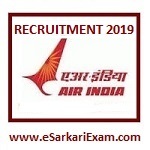 Click on Air India Transport Service, Delhi Various Post Advertisement Link.